The beaches of Lalarias and Strovoli on the island of Alonissos in Greece, information and pictures. Lalarias Beach and Strovilo Beach are two secluded beaches in the northeast of the island of Alonissos, not far from Agios Dimitrios. These two beaches are accessible by boat. 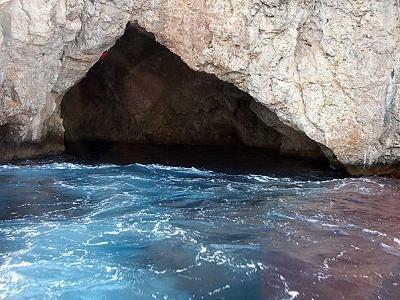 Between Lalarias and Strovilo Beach you find the "Blue Cave" which is visited by tour boats that depart from Patitiri during their daytrips on which they visit the small islands that are scattered around Alonissos. The water is a of beautiful colour here and the people on the tour boats have the opportunity to swim in and around the cave. It is also possible to rent a small motor boat and explore the coastline and the isolated beaches that you cannot reach on foot or by car in this way - (see Alonissos Boat Rental). Like this you can go and explore the Blue Cave and the beaches of Lalarias and Strovilo in peace and quiet on your own.